With the nomination of Oklahoma Attorney General Scott Pruitt, President-Elect Trump is making good on his promise to eviscerate the Environmental Protection Agency (EPA). Pruitt is a disaster for the environment and climate change. "Having Scott Pruitt in charge of the US Environmental Protection Agency is like putting an arsonist in charge of fighting fires," said Michael Brune, executive director of the Sierra Club. "He is a climate science denier who, as attorney general for the state of Oklahoma, regularly conspired with the fossil fuel industry to attack EPA regulations. Nothing less than our children’s health is at stake." Pruitt is a minion of the fossil fuel industry and supporter of ALEC. 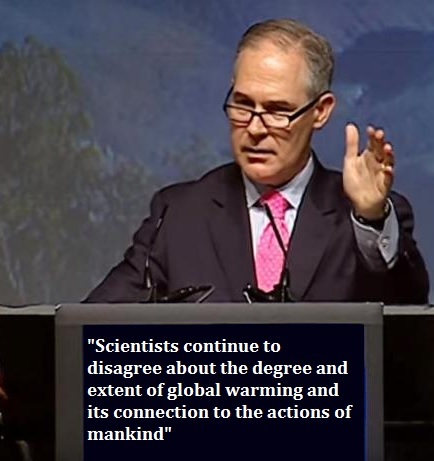 He is also an anti-science climate denier who has a track record of trying to dismantle the very rules that he now will oversee. "It's a safe assumption that Pruitt could be the most hostile EPA administrator toward clean air and safe drinking water in history," Ken Cook, president of Environmental Working Group, said. "Scientists continue to disagree about the degree and extent of global warming and its connection to the actions of mankind...That debate should be encouraged — in classrooms, public forums, and the halls of Congress. It should not be silenced with threats of prosecution. Dissent is not a crime." Since becoming Oklahoma's top legal officer in 2010, Pruitt has sued the EPA to prevent them from protecting public health against pollutants like soot, smog, mercury, arsenic, acid gases and other toxic pollutants from power plants. "As the Attorney General, Scott Pruitt did the bidding of the oil and gas industry and fought many of the laws he will now be tasked to enforce...He helped Big Oil turn Oklahoma into an Earthquake zone," said Friends of the Earth climate and energy program director Benjamin Schreiber. Pruitt is leading the charge against President Obama's Clean Power Plan and once he assumes power he is expected to dismantle the EPA's carbon rules. He not only campaigned against the plan he has campaigned against states that comply with the plan. On his LinkedIn page Pruitt states that he "has led the charge with repeated notices and subsequent lawsuits against the U.S. Environmental Protection Agency for their leadership's activist agenda and refusal to follow the law." It is important to understand that the Republican war against the environment that has culminated in the election of Trump is a relatively recent phenomenon spun for political gain. Republican presidents are behind some of the most important environmental actions in the nation's history. For example, the institution that Trump wants to destroy was started by Republican president Richard Nixon. By putting Pruitt at the helm, Trump is signaling an end to the agency's long and distinguished role as a champion for the health of Americans against corporate interests. Pruitt is described as, "a deeply flawed nomination that puts America's bedrock clean air and water protections at grave risk," by Environmental Defense Fund (EDF) spokeswoman Heather Shelby. Pruitt is a fossil fuel industry advocate. As a lackey for fossil fuels, his nomination was greeted with praise by the industry. However, this view was not widely shared. "You couldn't pick a better fossil fuel industry puppet," 350.org's Executive Director May Boeve said. "By appointing Scott Pruitt as head of the Environmental Protection Agency, Trump is putting America at risk," Greenpeace spokesperson Travis Nichols said. "Pruitt is a pure product of the oil and gas industry, installed in successive government posts to sell out his constituents at every turn. He will push this country far behind the rest of the world in the race for 21st-century clean energy. With Scott Pruitt as head of the EPA, the people and the environment will be in the hands of a man who cares about neither." Pruitt has suggested that climate advocates, who he calls climate alarmists, should be prosecuted for fraud. He said that if climate skeptics (aka deniers) are to be prosecuted for fraud so should climate activists. It is important to note that this comment is ultimately meant to protect the fossil fuel industry from fraud. Investigative reporting has revealed that ExxonMobil and the whole fossil fuel industry has committed fraud by withholding scientific information about the veracity of climate change. Sanders sits on the committee that must confirm Pruitt. Sanders has promised to oppose the appointment. "The American people must demand leaders who are willing to transform our energy system away from fossil fuels. I will vigorously oppose this nomination," Sander's said. Senators are being called to resist the appointment of Pruitt. David Turnbull, campaign director at Oil Change International said, "We call on Senators to reject this nomination, as well as other climate-denying, unqualified and regressive nominees. There is no place in our government for individuals who refuse to accept science and risk the safety of Americans around the country. There is no place in our government for individuals who are in clear alliance with the industry fueling our climate crisis. We need a separation of oil and state." "Pruitt is a wholly owned subsidiary of the oil industry," Kassie Siegel, director of the Center for Biological Diversity's Climate Law Institute, said. "Any Senator who doesn't fight this nomination is handing corporate polluters a wrecking ball to destroy our future." Click here to sign a petition telling Senators that Pruitt is not fit to lead the EPA.